The Egyptian Pygmy Mantis, latin name Miomantis paykullii, is a small species of mantis from Africa. It can be found in the countries Burkina Faso, Egypt, Ghana, Ivory Coast, Cameroon, Kenia, Mauritania, Mozambique, Nigeria, Oeganda, Senegal and Zimbabwe. There are many Miomantis species other than Miomantis paykullii, like Miomantis caffra and Miomantis alata. 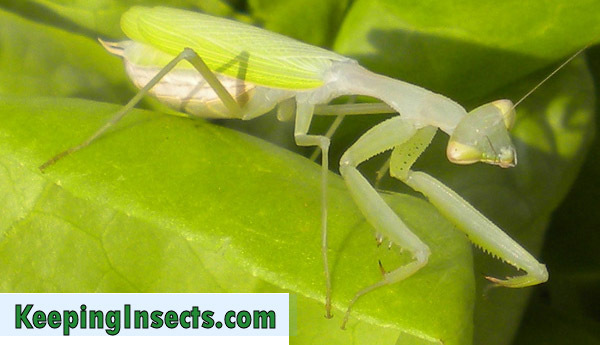 All are commonly referred to as Egyptian Pygmy Mantis. The species can not be cross bred but the way to keep and breed them is similar. That’s why I will only cover Miomantis paykullii in this website, it’s the most common Miomantis pet mantis. An Egyptian Pygmy Mantis will become around one inch long when adult. The males and females are approximately the same size, with females being bulkier and heavier than the males. 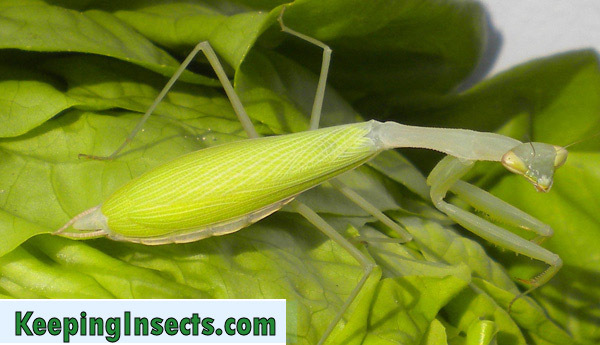 The color of this species of mantis can vary between light green, beige, light brown and dark brown. Egyptian Pygmy Mantises don’t have any special markings or color patterns on their body. This species of mantis is pretty calm although they will actively stalk their prey when they notice it. A prey that seems a bit large for this mantis does not seem to bother Miomantis, they are rarely deterred from attacking prey. When disturbed by people or predators this mantis will run or fly away. There is no known defense behavior like death-feigning or showing colored markings. It’s easy to find food for your Egyptian Pygmy Mantis, as it eats almost all prey insects species that have the correct size. Fruitflies are favorite for Egyptian Pygmy Mantises of all sizes and ages. Adult Egyptian Pygmy Mantids can also eat small crickets, moths, green bottle flies and any other insect species that is around half the lenght of the mantis. The Egyptian Pygmy Mantis does not have very high standards for its surroundings. A temperature between 18 °C and 30 °C is best, with an optimal temperature of 25 °C. In the night you can allow the temperature to drop to a minimal of 15 °C. The air humidity does not have to be high for this mantis. The nymphs need a spraying of water around 3 times a week. The adults can do with less, around 2 times a week. Make sure the mantis can drink the water droplets. The ventilation of the terrarium or enclosure needs to be pretty good, for example one side of the enclosure consisting of mesh. Miomantis paycullii needs, like all species of mantis, a terrarium or enclosure that is big enough for it to move around. Because the Egyptian Pygmy Mantis is just one inch long when adult, it won’t need too much space. An enclosure of 4 by 3 by 3 inches in size is enough for one adult Miomantis mantis. Give it plenty of sticks and decoration to walk on and hang from. Egyptian Pygmy Mantids cannot be housed together as they will eat each other. Getting your Miomantis couple to mate is very easy, although cannibalism could occur. First you need to make sure you have a male and female couple. Females are bulkier than the males and have wings that do not extent past the abdomen. Males have much longer wings and they also have long antennae. Approximately two weeks after the final molt you can place the male and female together in a big enclosure. Make sure there are plenty of hiding places. It would be ideal if you can make sure the male notices the females presence before she notices him. Both mantises should have had plenty to eat in the days prior to the mating. If possible, feed the female a large prey item before introducing the male. This makes sure she is busy when the male approaches her. If a female responds aggressively to a male it’s better to remove him and try again on another day. After mating the female will lay around 10 small beige ootheca. The first one usually comes a few days after mating, the others come around every 1 – 2 weeks depending on the food and the condition of the female. One mating is enough for many fertilized ootheca. From every ootheca round 15 nymphs are hatched. 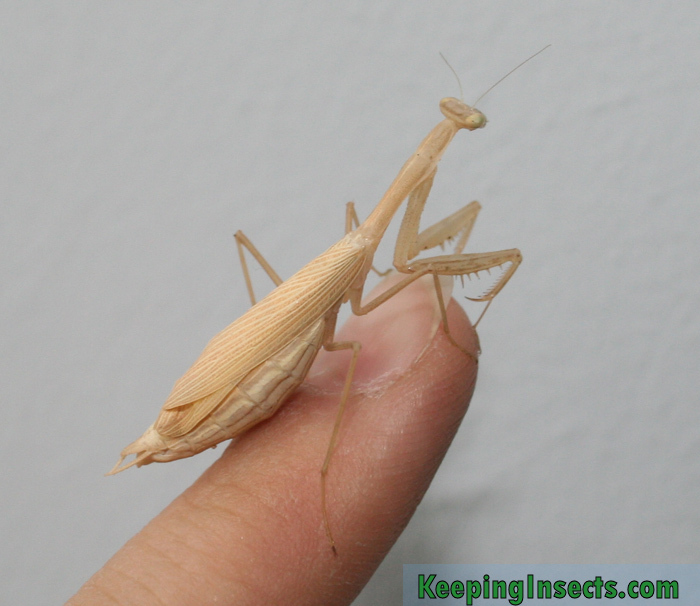 You can keep the ootheca at the same temperature and humidity as the adult mantises. Make sure no molt can grow on the egg sack or in the enclosure. Miomantis females have an exeptional skill for mantises: even without mating with a male Miomantis they can produce eggs that hatch. These offspring will be exclusively female. The way of reproducting is called parthenogenesis. You might know it from stick insects. In mantises this is very rare. In Miomantis paykullii parthenogenesis is probably rare in nature because males are usually present and the offspring produced by parthenogenesis is much weaker than the “normal” nymphs.